Walkthrough, Game Guide & Maps. Dragon Age: Inquisition Walkthrough, Game Guide & Maps. 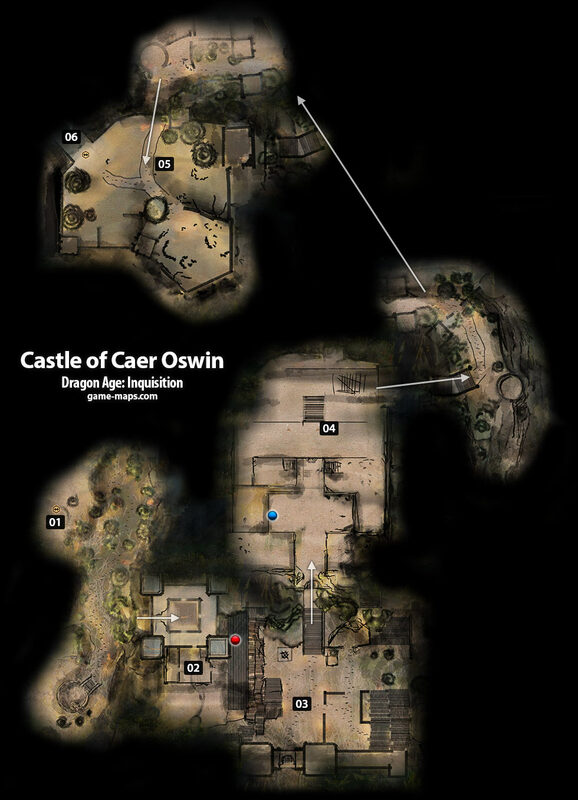 Castle of Caer Oswin - Dragon Age: Inquisition Walkthrough, Game Guide and Maps, with Quest and Locations of Camps, Merchants, Rifts, Ocularums, Astrarium, Dungeon Entrences, Landmark (POIs), Crafting Station, Mosaic Piece, Inquisition Agent, Secrets, Party Members, Bottle of Thedas and Codex Entry. The birth of the Chantry took place more than nine ages ago, the mists of time have obscured once well - known facts. It is commonly believed the Chantry alone created the templars and the Circle of Magi. Few recall there was ever an Inquisition. Those who do, believe it predated the Chantry, hunting cultists and mages in a reign of terror ending only upon its transformation into the Templar Order. This is not quite the truth. One must keep in mind the state of Thedas prior to the Chantry's creation: a world where the only source of order - the Tevinter Imperium - had fallen apart. People blamed magic for the death of Andraste, the Blight, the terror they saw every day - and not without reason. Abominations and demons rampaged the countryside. No one was safe. Disparate groups of men and women initially formed the Seekers of Truth, determined to reestablish order because no one else would do what was necessary. The truth they sought, the question they tried to answer, was how to restore sanity in a world gone mad. Was theirs a reign of terror? Perhaps. Evidence suggests they were as vigilant in their protection of mages as they were of regular people. When they intervened, they convened an ad hoc trial to determine the guilty party. This even application of justice led to their poor reputation, the Seekers came down against every group at one time or another, their "Inquisition" gaining notoriety for being on no one's side but their own. They considered themselves good people, however - followers of the Maker's true commandments. This was never more evident than when they lay down their banner in support of the fledgling Chantry. They believed with all their heart that the Templar Order was the answer a desperate Thedas needed in a terrible time. Ultimately, the Inquisition was composed of independent idealists, not Chantry zealots, that is the truth. Cassandra has reason to believe that Corypheus is behind the disappearance of the Seekers of Truth, but she requires help to prove it. Have Cullen, Leliana, or Josephine investigate the disappearance of the Seekers. Use the World Map to travel to Caer Oswin. Follow up with Cassandra at Skyhold. Meet Cassandra back at Skyhold after she's had a chance to look through the Lord Seeker's book. Location - This is in game location. The sequence of numbers shows suggested order of visiting locations. Starting Quest Location This is location with quest giver. It can be item, person or place. Inquisition Camp - Heals, restock potion, place to rest, change party members, use it to fast travel. Setup camps as fast as you can. Landmark - POIs (Points of Interest). Visit and claim to complete collections. Shop Traders & Merchants, to buy / sell items. Crafting Station - Here you can create or modify Weapons, Armor, Accesories, Runes and Potions. Fade Rift - You can close Rifts using your ability. Rifts grows in difficulties in following locations. Closing a Fade rift rewards with amount of Power. There are a total of 81 rifts in Thedas. Astrarium - Astrariums are ancient relics of Tevinter origin that allow the viewing of constellations in the stars. Solve Astrarium puzzles to reveal secret location with treasure. Ocularum - Use Ocularums to reveal locations of magical Shards. Shards can be used in Forbidden Oasis Location. Dungeon Entrence - Entrence to Cave, Dungeon, Crypt, Underground. Fast Travel - You can travel to this points pointing on world map. Mosaic Piece Collect mosaic for Collections. Mosaic sets are Sacrifice, Invasion, The Fall, Archdemon and Freed Are Slaves. Each Mosaic set has 12 pieces. Bottle of Thedas Collect Bottles for Collections. There are 29 bottles that can be collected. Inquisition Agent Here you can hire new Inquisition Agent. Secret - Use Search ("V" on PC) to reveal secrets. Sometimes you need to use search key few times. Codex Entry It can be book, letter, place, item. After you collect 250 codex entries you become Loremaster. Specials - Important place, interesting place, easy to be missed, just look around carefully. Ballad Collection - Song Lyrics or sung song for Collection. There are 21 songs to collect. Logging Stand - for Resource Requisition Quest, used for crafting Skyhold improvements. Quarry - for Resource Requisition Quest,, used for crafting Skyhold improvements. Artifact - Artifact to Activate for Solas. When activated they strengthen the Veil in the close area. Keep - Tou have to defeat enemy and claim this keep for Inquisition, then it will be your Camp. Operation - You have to perform Operation here. Dragon - Dragon for High Dragon Collection. There are 10 high dragons in Dragon Age: Inquisition.